A Tiny Renoir, Stolen In The '50s, Finally Comes Home To Baltimore Museum On the Shore of the Seine was stolen in 1951. It resurfaced in 2012 when a woman claimed she found it at a flea market. A Washington Post reporter investigated and found the story wasn't so simple. Renoir's On the Shore of the Seine returns to the Baltimore Museum of Art more than 60 years after its theft. Rumor has it Renoir painted the tiny piece on a linen napkin for his mistress. It was stolen from the museum in 1951 and resurfaced in 2012 when a woman tried to sell it, claiming she had bought it at a flea market. 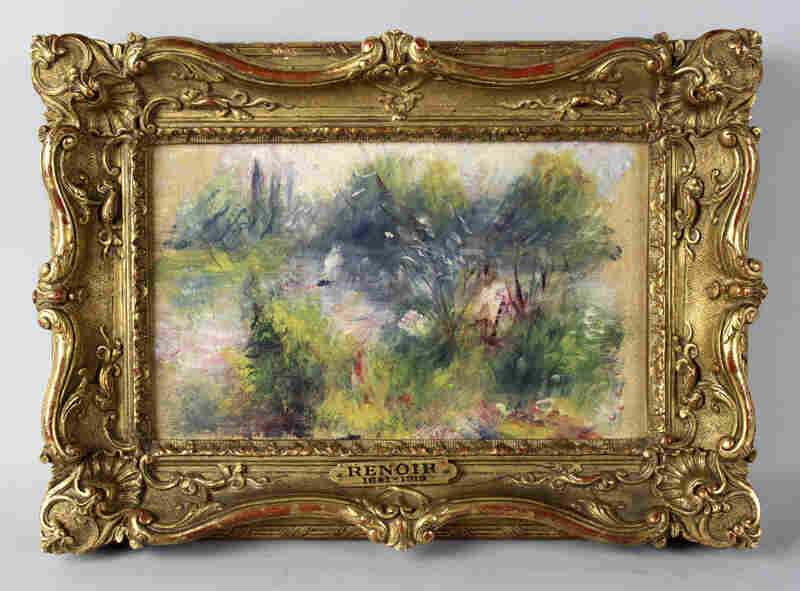 At first it was known as the Renoir found at a West Virginia flea market — a woman took the painting to an auction house where they concluded that it was, indeed, On the Shore of the Seine, a Renoir that had been purchased in Paris in 1925 by American art collectors Herbert and Saidie May. In a news release, the auction house said it could sell for up to $100,000. The flea market story intrigued Washington Post reporter Ian Shapira. He knew that Saidie May was a major donor to the Baltimore Museum of Art, but when he called the BMA, they told him they had no record of the painting. Shapira went to the museum to look through May's papers anyway, just days before the auction opened. "I found some documents showing that the museum had actually owned this painting and then the museum discovered documents on its own showing that the staff back in the 1950s had actually reported the painting stolen," Shapira says. It was stolen — possibly in the middle of the night — in November 1951. Once the Baltimore Museum of Art confirmed the Renoir belonged to it, it immediately contacted the auction house. The auction house contacted the FBI, and the FBI seized the painting. But that's not all Shapira discovered. His first clue something was amiss in the flea market story was a phone chat he had with the woman's brother. "He said something along the lines of: 'Oh, yeah, that painting had been in my mother's house for years,' " Shapira says. It turns out their mother, Marcia Fouquet, was an artist: She "was a painter herself who went to art college in Baltimore at the time of the painting's theft," Shapira says. She was a beautiful woman "who had a certain charm over men." Fouquet lived in a house in Fairfax, Va. She rented out some of the rooms, and Shapira tracked down some of her former tenants. "Many of them told me in interviews they remember seeing this Renoir hanging in her house for decades," he says. The painting became sort of a prodigal child. No matter how many children you have — and we have 90,000 in this institution — you feel for the one that is lost. So to be able to have it come home is just incredibly meaningful for us. But — as far as Shapira could tell — Fouquet never told anyone how she got it. She died at age 85 in September 2013. The case ended up in court — with the daughter still claiming she bought the painting at a flea market so it belonged to her, and the Baltimore Museum showing evidence of ownership of the stolen Renoir. The judge ruled in the museum's favor. After more than 60 years, the Renoir was returned. On the Shore of the Seine is tiny, smaller than a sheet of paper. But the miniature landscape — of a sailboat in the distance — is bursting with color. The story goes that Renoir painted it around 1879 on a linen napkin — for his lover. With so much international interest, the painting is getting quite a homecoming. "The painting became sort of a prodigal child," says Doreen Bolger, director of the Baltimore Museum of Art. "No matter how many children you have — and we have 90,000 in this institution — you feel for the one that is lost. So to be able to have it come home is just incredibly meaningful for us." The exhibition "The Renoir Returns" opens to the public Sunday. The mystery of who stole the painting in 1951 remains unsolved. As for Marcia Fouquet's daughter, she says she will not appeal the judge's ruling.